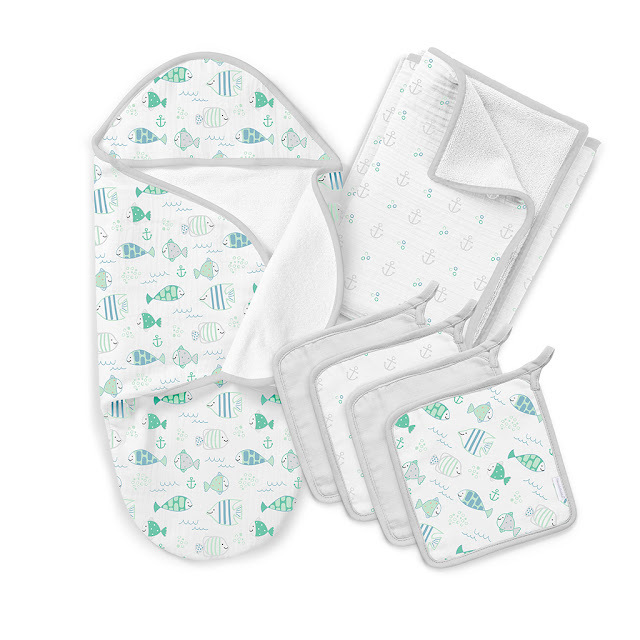 SwaddleMe has 5 new additions to their line of safe sleep products for infants! Adorable new swaddles that are uniquely genius and perfectly arranged new gift sets for the new baby in your life. I am getting baby fever just looking at these innovative new products. When I first became a parent, I swaddled my son with his baby blankets, luckily knew how to as it was a common way to wrap a baby when they're infants in my culture. But with my second and third I discovered ready to go swaddles, and sleep sacks that made it all so much more convenient and safe for baby. 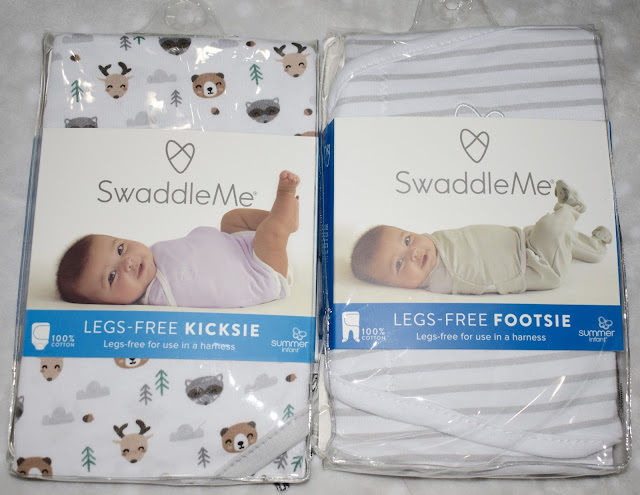 SwaddleMe has come out with the new SwaddleMe Footsie, and SwaddleMe Kicksie - new versions of their original swaddles. Adorable names to go with effective products that will help new parents cater to their child's stage in development. 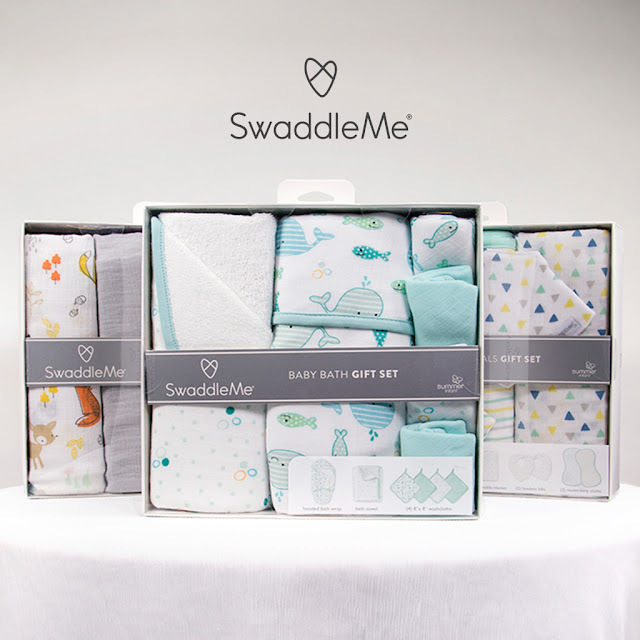 Many of my peers are having babies lately, and I am loving the 3 new SwaddleMe Gift Sets. They make the perfect present for a mom-to-be. You can choose from the 3 or buy them all. These items will be used and loved for sure! Available in the Essentials, Baby Bath Time and Little Lovey Gift Sets. As you can see, these all make for a great gift for any new parent, or parent to be! The Essentials Gift Set includes 6 items including the SwaddleMe Original Swaddle, Muslin Swaddle Blanket, 2 Muslin Bandana Bibs, and 2 Muslin Burp Cloths. These are perfect items if you're not sure what to get, these are perfectly boxed and packed for you! The Baby Bath Gift Set includes the perfect needs for babies first bath! I remember that sweet memory when I gave my children their first baths, both real bath and "sponge-bathes" avoiding the belly button stump. These are all great for a new baby, truly makes me wish my children being babies. This gift set includes 1 Hooded Newborn Bath Wrap, 1 Bath Towel, and 4 Muslin Wash Cloths. 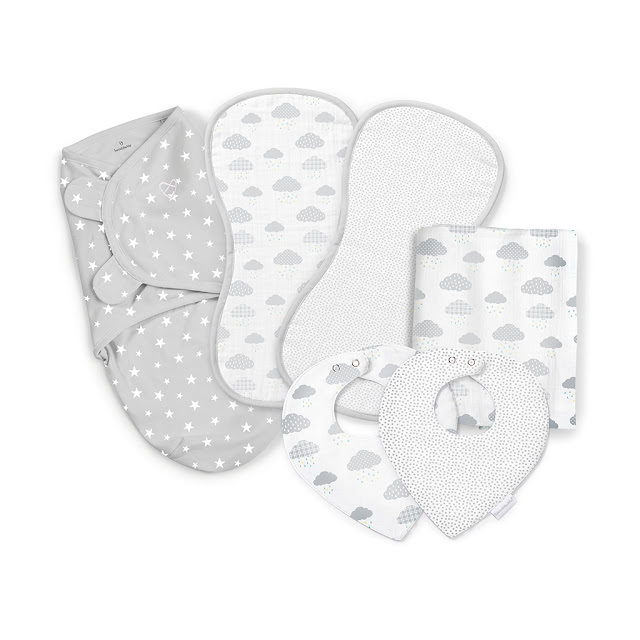 They are all made with soft material, gentle on baby's soft skin. I told you all these gift sets are adorable! 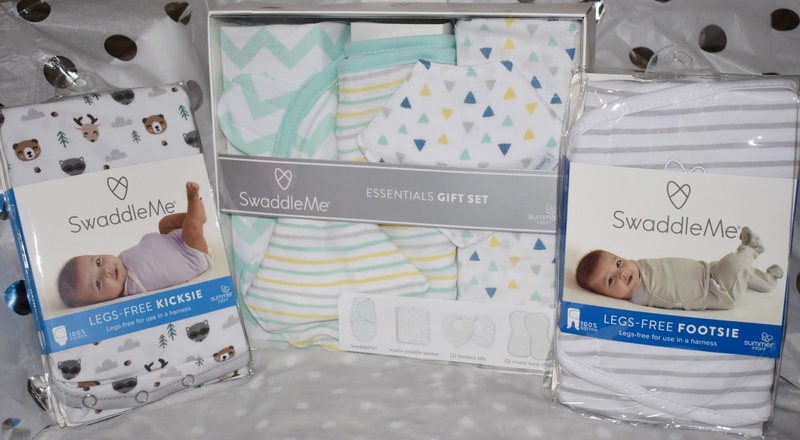 This Little Lovey Gift set includes 1 SwaddleMe Original Swaddle, 1 Pacifier with Plush Character, and 2 multi-use 40"x40" Muslin Swaddle Blankets. Perfect for soothing baby, giving them and you a comfortable, relaxing time. The large muslin can be used in many ways, to gently cover them while you rock them to sleep in your arms. As a nursing cover, swaddle, burp cloth and more. The little pacifier with plush is going to grow with baby as they learn to self soothe and grab. I am excited for my friends who are expecting so their babies can use the SwaddleMe Kicksie and Footsie. I am excited for all of you with new babies in your lives. It can be a tough but oh-so-amazing time in our lives. Enjoy every moment, and treat yourself to products that'll help you! All 3 gift sets are available for $39.99 each. I love all of the new additions to the SwaddleMe collection, and that they're made with safety, comfort and ease of use in mind. SwaddleMe says "Wake up feeling wonderful, because when baby sleeps better, you sleep better". Let SwaddleMe help you give your baby and you that wonderful sleep.